DecorMyEyes.com is pleased to offer the best designer eyewear for all your winter needs, including ski and snowboard goggles and ski sunglasses. 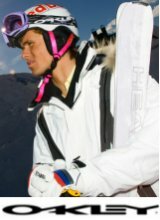 Here at DecorMyEyes.com you can expect to find the best deals for ski and snowboard goggles from top manufacturers such as Bolle,Smith Optics,Oakley,Serengetti and many more. All of our winter eyewear comes with a full manufacturer's warranty and all factory included accessories!. Our Designer Ski and Designer Goggles offered on our web site provide excellent protection and performance in harsh environments. We carry a large array of different ski and snowboard goggles which will be the perfect addition to any winter trip. Adding comfort to your riding, these high quality ski and snowboard goggles can also enhance your skills for beginner riders. We have products available in all types and sizes, ranging from kids goggles / teen goggles all the way to adult ski and snowboard goggles.